Parents of a disabled child with complex, profound medical care needs are constantly fighting for timely care, appropriate services, and more support. It is truly a never ending battle that wears us down as we try to keep up with the daily care needs of our child. Adding these battles into the mix only serves to add stressors to an already very difficult journey. Parent carers should not have to fight for basic equipment and supplies that keep a disabled child safe and healthy. — Today I spent 2 hours trying to find out why my son’s nappy order was not delivered. He ran out of nappies this morning. I had not a single one in the house. It turns out the PHN (public health nurse) didn’t renew the order last week when I asked her to, telling her at the time he was nearly out. While making over a dozen phone calls trying to sort it all out, I had to resort to wrapping a disposable incontinence sheet, stuffed with kitchen roll, around him and seal it shut with tape. Just call me MacGyver. As it happened, the local health centre had a spare bag of nappies and a very kind neighbour drove into the village to get them for me since Brendan is on bedrest today due to his pressure sore getting worse. I won’t get his nappy order now for another 7 days, so will be seeking out more nappies early next week to get us through until then. There should be more competence by those entrusted with delivery of care for disabled individuals, and children like my son should be given more respect than made wait for something as basic as incontinence products! — For over a month now I’ve been fighting for my son to get the ordered renal ultrasound done immediately as he is holding his urine for 24 or more hours at a time on a very regular basis, complete with his lower abdomen becoming distended for hours until he floods himself and whatever he is lying or sitting on. The scheduled appointment has him waiting just over 2 months for a simple ultrasound because that department at the hospital apparently is so busy they can’t work in a fragile, disabled, medically complex, palliative, child in any sooner. Oh, unless I take him to the Emergency Department, have him reviewed, and they admit him to hospital. THEN he could get the ultrasound done, I am assured. I’ve seriously considered doing this, but I know it is a gamble taking him into an ED and waiting for hours while his highly compromised immune system is exposed to God knows what in that time. And nevermind that I also have another son I would need to sort out care for so I could be at the hospital for a couple of days. There should be NO wait for children like my son to receive such a simple, but incredibly important, procedure. — For over 2 months now I’ve been trying to raise funds to purchase a safe ramp system for entry into my rental home, but the fundraiser is going at a snail’s pace. 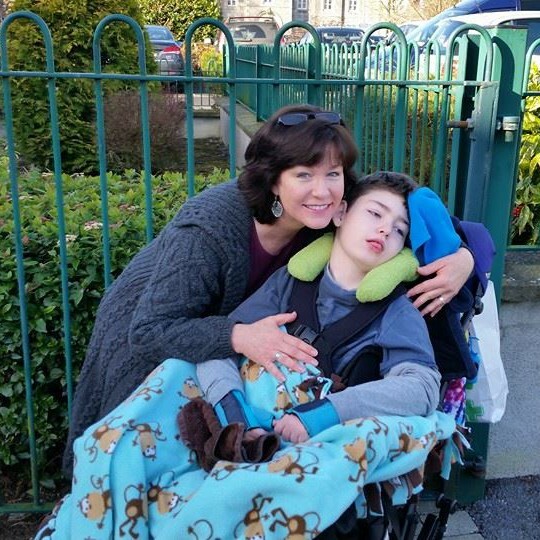 I can’t get Brendan inside the door unless my 8 year old son is on the other side to help lift his big brother’s wheelchair over the bottom of the door frame – and even then I’ve nearly fallen backwards, with Brendan in his chair, countless of times. Coming out of the house I must hold onto the door jam so not to lose control on the steep, short ramp. There should be help in purchasing a safe ramp system for families like mine, for the sake of the disabled child. — For nearly 3 years I have rented privately, which means the bathroom cannot be modified into a safe, accessible, wet room for my son. I can’t afford to buy my own home and I am not on the council housing list, which even if I was, I hear it is many years long. I can’t even use a hoist to lift him in and out of his too small, unstable bath chair. This must change. It is unsafe for both me and my son. But what is one to do when there is no governmental assistance in this regard? There should be help made available for families like mine who, because they rent privately, don’t have access to county council assistance. dignity, safety, and timely and appropriate health care. Why do we have to fight so hard? I read your Blog & constantly nod my head YES YES YES!! I have a 13 1/2 year old son with Miller-Dieker Lissencephaly (Griffin) and I swear your life runs a close parallel to ours. We are in the US. I am also a single mom & have 5 year old son (along with 2 adult children). Running out of diapers has happened & the stores don’t carry anything close to working-Grif leaks with his good fitting diapers on a daily basis. I could go on & on with our struggles…. Thank you for putting voice to what we go through with these special kiddos!